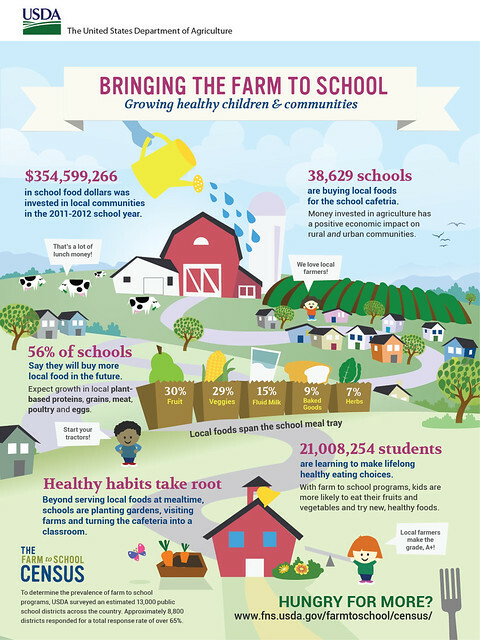 The term Farm to School encompasses a variety of efforts to connect schools with local farms. While programs vary by locality, they commonly include: serving local food in school meals; and educating about local food and agriculture through classroom learning, school gardens, field trips, and celebrations. Students learn about local agriculture and have access to delicious local foods; farmers gain new markets for their products; and local economies grow stronger. CCE Farm to School Outreach aims to help extension professionals, food service professionals, farmers, teachers, parents and community members develop farm to school connections. This program website serves as an informational hub. CCE Farm to School Outreach is supported in part by Cornell Cooperative Extension and is based in the Division of Nutritional Sciences in both the College of Human Ecology and the College of Agriculture and Life Sciences at Cornell University. Schools will serve healthy meals that incorporate New York- produced foods. Students, teachers, parents, school food service professionals and community members will become more aware of their local food and agricultural systems. New York farmers will gain access to local markets. Local economies will grow stronger. The United States Department of Agriculture (USDA) Farm to School Program and the National Farm to School Network offer on-line resources, technical assistance, training, and grants.